Forging pattern (kitae hada) : Kitae hada is combination of fine Itame-hada (wooden grained) and Mokume (burl grain mark). There is masame grain marks in shinogi-suji. The side of shinogi-suji in hiraji is covered with Utsuri reflection. Tempering pattern (hamon) : Hamon is wavy (Notare) mixing with small gunome(zig-zag) and small choji-ha(clove outline), tempering outline is covered in fine ko-nie glitter. The interior of temper is splendidly active with small ashi, Uchinoke, thick Nie lines and sunagashi activities. Temper of tip (boshi) : Boshi is wavy hakikake in front and the ura is straight small circle, deeply turn back. Tang (Nakago) : Nakago is unaltered (ubu). Ha-agari Kurijiri heel shape. Two mekugi ana. Katte-sagari file marks. The signature in omote is long character which is composed of a place of work [Bizen koku ju Osafune], real name (zokumyou) [Hikobei-no-jo] and the smith name [Sukesada]. The ura is chiselled the date of year, the second month, sixteenth year of Eisho (A.D.1519). This is a masterpiece by the head of Sukesada family [Hikobei-no-jo], a father of Yoso-zaemon-no-jo Sukesada. The entire construction is considerably stout and heroic. 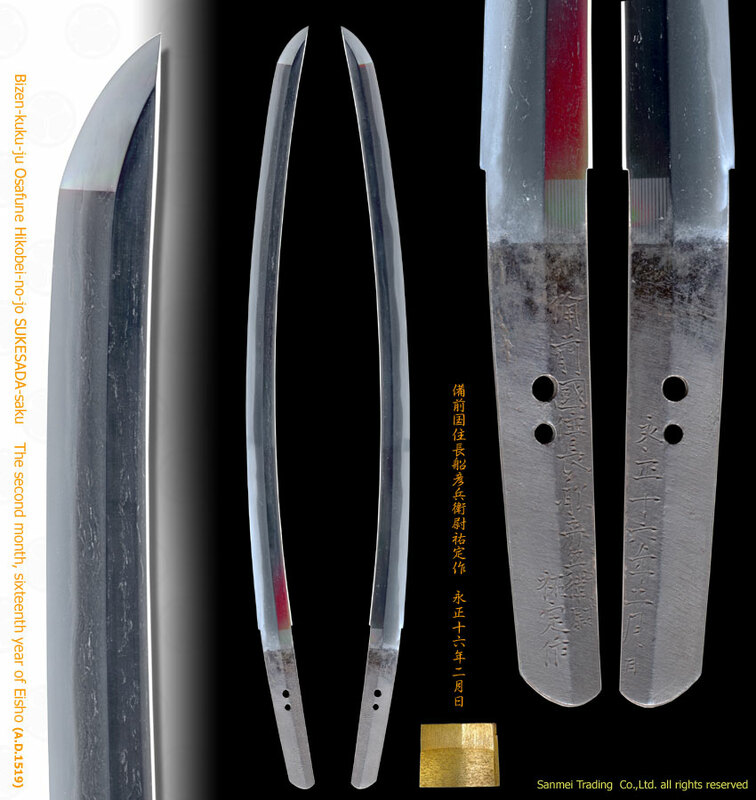 There is a mixture of middle and upper pointed curve leading to a extended large kissaki. Massively short tang was designed for a single-palm grip style. 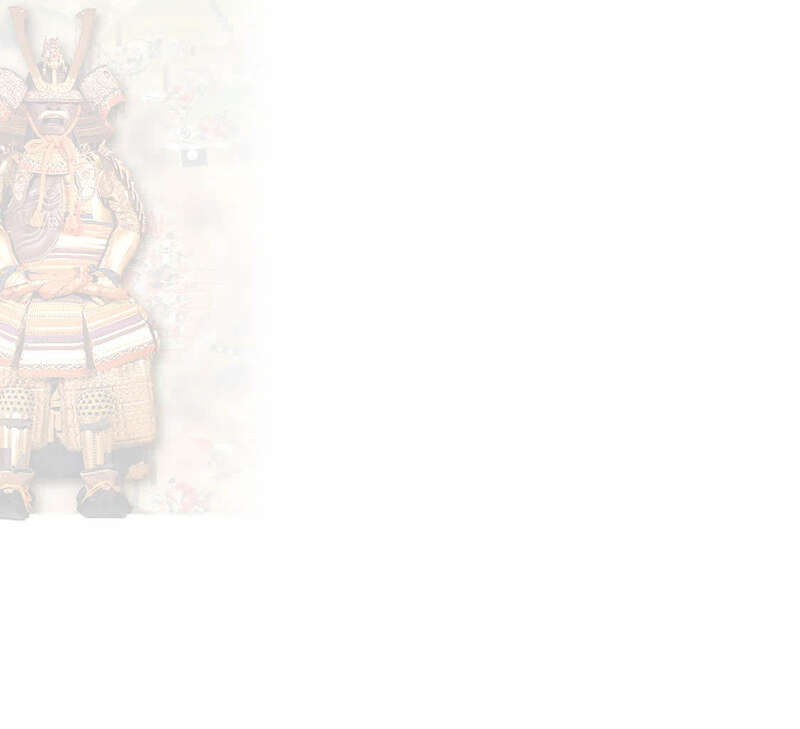 Very well balanced and gallantly upholding dignity of a weapon during the Warring States period. 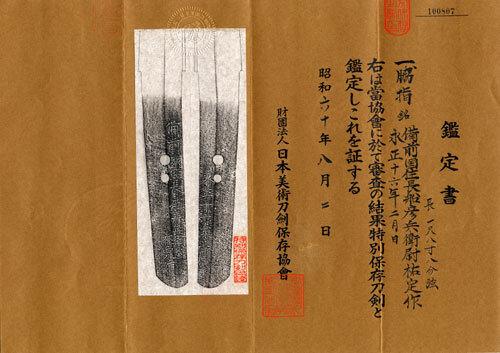 This is a very rare uchikatana with his additional real name. superior work. Double layers gold habaki, Shira-Saya plain wood mounting.